My fellow church folk will know what I’m talking about. You know that last five minutes or so of service, when you’re trying really hard to pay attention and hear the last announcements and sing the last song, but your brain just goes LUNCH LUNCH LUNCH? I kinda went there yesterday. The noodles awaiting the chicken on the plate. Before the last note, I had created this very dish in my head. Just to make it more appealing to my carnivorous husband (and to continue to play with my new OptiGrill), I grilled some plain chicken breasts with it. Well, loaded with olive oil and kosher salt and freshly ground pepper that my husband did for me because I had one raw-chicken-hand and the pepper grinder is a two-handed operation. But still. 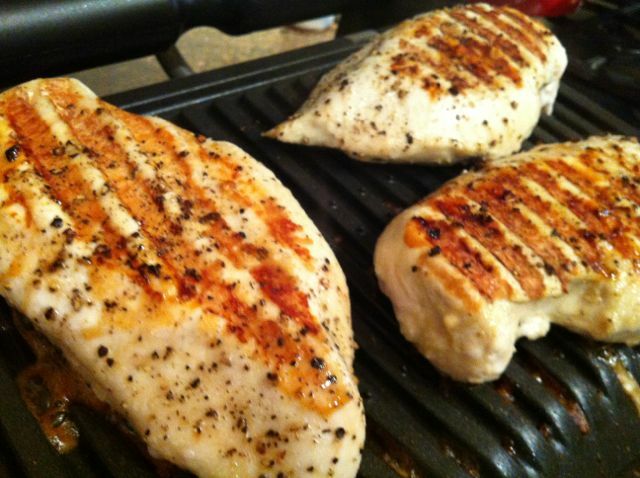 Chicken breasts on the OptiGrill. Delish, but I think I’ll take them off a tad earlier next time. You should make this. Really. Even if you’re not gluten-free. 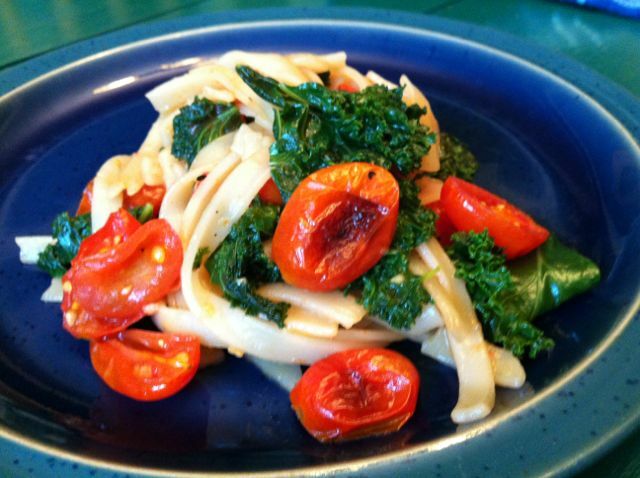 If you want, you could use soba or buckwheat noodles, or even plain old fettuccine. Tamari noodles and kale and a gratuitous slab of chicken. Turn on your oven to broil (500 degrees or so, a slower broil, if it gives you the option) so it’s ready for the tomatoes later. Boil the noodles in salted water until al dente just as you would with regular pasta. (You may have to break them up a bit before putting them in the pan…do this inside a plastic bag to avoid shooting shards everywhere!) Drain and immediately place in a bowl or back in the pot and toss with tamari/soy while still hot. Cover the container while you work on other stuff. In a large, high-sided sauté pan, heat one tablespoon of the olive oil over medium heat. Add the minced garlic and heat until the garlic is fragrant, no more than a minute or so. 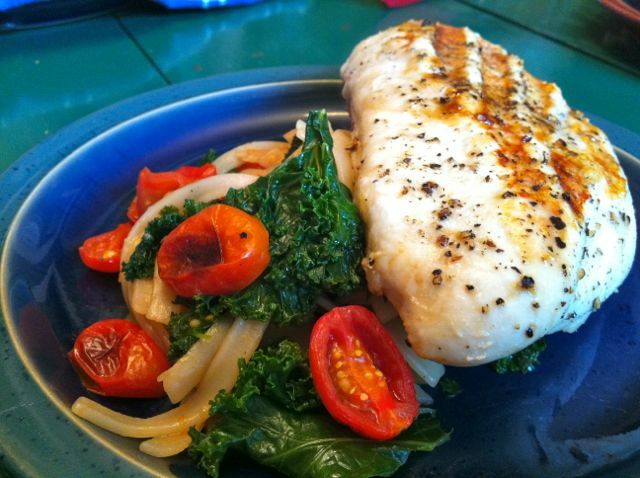 Add the kale pieces right on top of the garlic. Don’t worry about drying the kale; the water will help wilt it with steam. And also don’t freak out if it towers higher than your pan; it will cook down quickly. Stir and turn the greens occasionally to help them cook evenly and to move the garlic around so it won’t burn. When the kale is wilted but not completely soft and turns a bright green (or sooner if the garlic starts to burn), add the broth and stir a bit. Add the vinegar and nutmeg, plus a sprinkle of kosher salt to soften things up, stir again, cover the pan. Turn down the heat to low. On a sheet pan, toss the halved tomatoes with the remaining olive oil, along with a good sprinkling of kosher salt and freshly ground pepper. Place in the broiler for 5-10 minutes, depending on your oven and the rack’s proximity to the element. Just keep an eye on it, will ya? Use this 5-10 minutes to deal with other parts of the meal (such as the chicken), get your kids off their butts to prepare their own drinks, or generally look busy in the kitchen until it’s time to plate this up. When the tomatoes are slightly browned, blistered and awesome, remove from the oven. 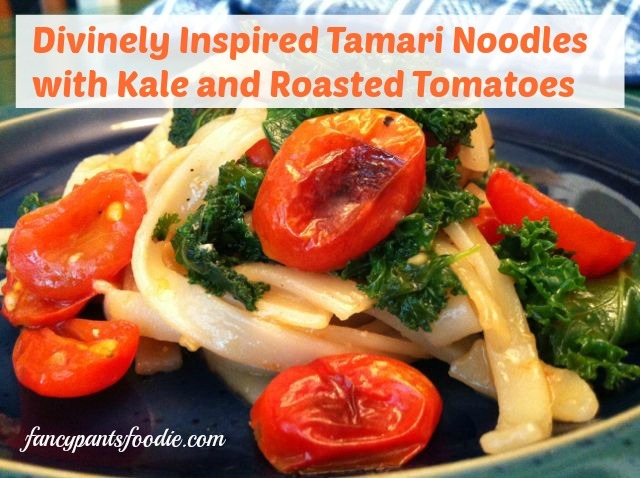 Place the tamari noodles right into the pan with the kale, which should be gloriously wilted by now. Add a bit more broth to loosen up the noodles if they stick together. Turn the heat back up a bit, toss the stuff together. Add the tomatoes. Taste. Season as needed. Put it on the plate, sprinkle on the seeds if you had more time to deal than I did, and feel like a bohemian kale-eating rock star. Or hungry choir girl.